Germania Antiqua in quatuor magnos populos, in minores et minimos distincta, et Regiones Danubium inter et mare Adriaticum contentae. 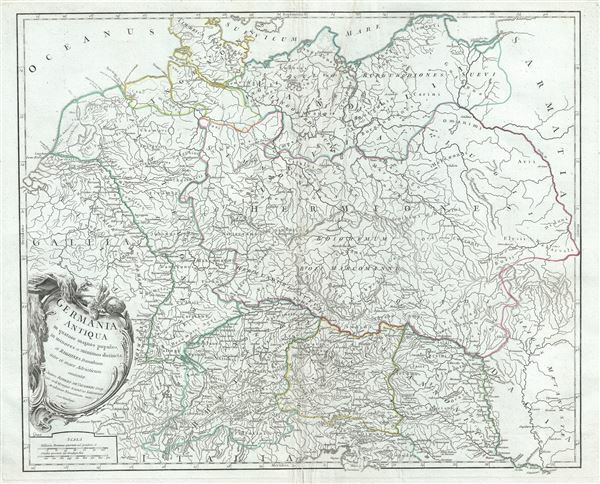 This is a fine 1756 map of ancient Germany by Robert de Vaugondy. It covers the lands of the Germanic people prior to the fall of the Roman Empire, from modern day Denmark to the Adriatic Sea and from France to Lithuania. Several important cities and towns are identified throughout, along with rivers, lakes and other topography. At the time, 'Germania' was a name given to the lands between the Alps and the Baltic Sea. The region was inhabited mainly by Germanic, but also Celtic, Baltic, Scythian, proto-Slavic people. Caesar Augustus described the Germanic tribesmen north of the Roman Empire as extremely savage and a threat to Roman Gaul to be conquered. His Roman Legions, led by generals Germanicus and Tiberius, conquered Germania Magna to the River Elbe, and occupied it until the Romans were defeated at the Battle of the Teutoburg Forest, in 9AD. The Romans withdrew, establishing the Rhine and the Danube Rivers as Germanic boundary of the Roman Empire. …they affirm Germania to be a recent word, lately bestowed. For those who first passed the Rhine and expulsed the Gauls, and are now named Tungrians, were then called Germani. And thus by degrees the name of a tribe prevailed, not that of the nation; so that by an appellation at first occasioned by fear and conquest, they afterwards chose to be distinguished, and assuming a name lately invented were universally called Germani. The lower left quadrant depicts a beautifully engraved title cartouche. This map was drawn by Robert de Vaugondy in 1756 and published in the 1757 issue of his Atlas Universal. The Atlas Universal was one of the first atlases based upon actual surveys. Therefore, this map is highly accurate (for the period) and has most contemporary town names correct, though historic names are, in many cases, incorrect or omitted. Very good. Some wear and verso repair along original centerfold. Original platemark visible. Minor creasing and spotting. Rumsey 3353.007. Pedley, Mary Sponberg Belle et Utile: The Work of the Robert de Vaugondy Family of Mapmakers, 247, state 1.